The Terminillo was launched for tourists in the thirty years after a visit of Benito Mussolini that he was “impressed by the beauty of the mountain range.” It was thus realized a wide road from Lisciano Pian De ‘Rosce subsequently completed until Terminillo (State Road 4a of Terminillo), while in the twenties Terminillo could be reached only on foot or on horseback through trails. In the thirties, then it starts the tourist boom with the first-equipped ski slopes. In 1940 he was made the cable car, still it exists. From the fifties to the seventies Terminillo ski resort is the reference of all Central Italy. In this period it becomes a meeting point of the “good Roma”: you staying politicians as Togliatti and Nilde Jotti, the Prime Minister Giuseppe Pella, etc. They were regular visitors exponents of cinema as Gino Cervi, Ugo Tognazzi, Vittorio Gassman (here he met his second wife Dorothy), Marcello Mastroianni, Jean Sorel, Gina Lollobrigida (here in 1949 married Mirko Skofic), Bice Values, Paul Flake, Antonello Falqui, Luciano Enner, Giuliano Gemma, Raf Vallone, Massimo Girotti, Rossana Podesta, Eleonora Rossi Drago, Bruno Modugno, Carla Del Poggio, Anna Maria Ferrero, Marina Vlady Versois, Tina Pica, Luigi Zampa (who here perfected the screenplay of the local doctor) and Eduardo De Filippo (who used to spend the Christmas holidays with the family, right here on the morning of January 5, 1960 Luisella her daughter died just ten years to a brain hemorrhage). Terminillo, both for the exterior and interior of hotels, became the set for the filming of many movies, including The mistake of being alive (1945), luxury Maidens (1952), Endless Love (1958), the aunt of America goes skiing (1958), the Last judgment (1961), let’s talk About women (1964). The eighties and nineties, due to lack of investments to renovate, modernize and expand the lifts, Terminillo also going through a crisis due to the increased competition of Abruzzo stations, suddenly become closer to Rome after construction the A24. Over the past 20 years the plants have been reduced, but the Lazio Region has allocated 20 million euro for the renewal and increase of skiing facilities, but the region itself has rejected in September 2015 the Project T.S.M. (Terminillo station Montana) that had instead seen a 100% consent of the municipalities in the district and contained both the modernization of the plant to the construction of new landscaped paths and new shelters, as well as the union of the west side with that leonessano (est ). At present (February 2016) is an ongoing debate between the proponents TSM project and the technicians of the Lazio Region to ensure that the project be approved, albeit partially modified. The proximity to the capital meant that is colloquially referred to as “the mountain of the Romans”: tourists from the capital will in fact often frequent the slopes; Also the name can also be explained by the fact that, unlike the other peaks above 2000 meters of the central Apennines, the Terminillo is often visible from Rome, especially on clear winter days, in which appears the entire snow-covered mountain. From a geological and geomorphological point of view it is a quite vast limestone massif (perimeter of almost 70 km), almost detached and isolated from other mountains of the central groups, typically Apennine terms of geomorphology (never too harsh, but still divided) and as for flora and fauna. The southern slope that overlooks the plain of Rieti, much man-made and exploited for tourism, is at greater altitude than the northern, more rugged, wild and intact, looking towards the plateau of Leonessa. It departs the most westerly of the central ridge that is grafted to the south-east to the nearby mountains Cicolano, then follow the Monti Carseolani and Simbruinis and so on as you head south east along the main Apennine watershed, or grafted on central ridge of the central mountain range with the Monte Nuria, the Mountains of the Duchess and the Velino-Sirente. 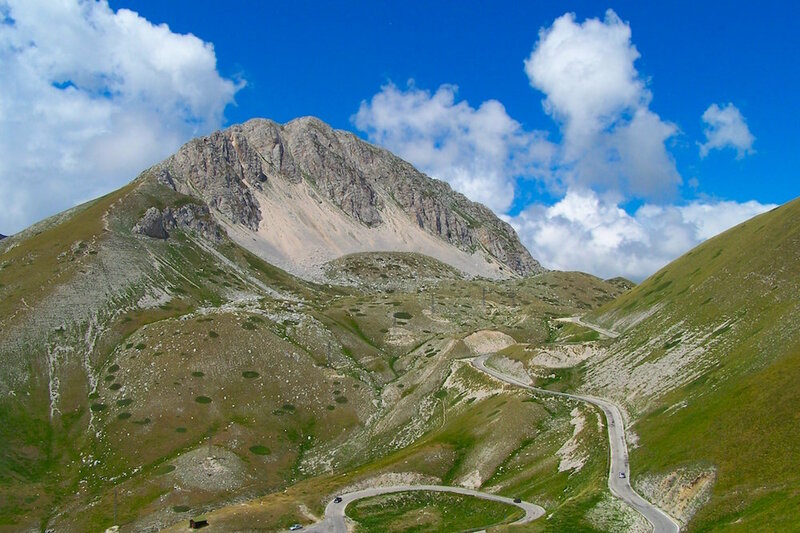 The massif of Terminillo consists of several peaks over 2,000 meters (the summit of Terminillo, Mount Terminilletto (2108 m), the Cresta Sassetelli (2139 m), Mount Elephant (2015 m), Monte di Cambio (2081 m )) and the other at lower altitudes (Monte Terminilluccio (1864 m), Monte Macchialaveta (1824), Monte Tilia (1775 m), Monte Corno (1735 m), the Table Mountain (1696 m), Cima d’Arme (1678 m ), Monte Rosato (1504 m)) and on each side is marked by wide and deep valleys that determine the orographic boundaries and separate it from other small mountain ranges that surround it (the Mountains of Cantalice and Poggio Bustone, and Rivodutri Morro Rieti). Among these valleys they stand out as the natural interest that leads to Vallonina Lioness homonymous Sella di Leonessa, the Ravara and Cape Scura valleys that descend instead into the river Velino and the ancient consular Salaria. On the opposite side are the Valleys of Hell and angels that descend towards the plain of Rieti and the mountains of Cantalice. Up to mid-mountain quotas (1600-1800 m) it is covered by forests on all sides.